When people want the best care for a serious illness, they often seek out a cutting-edge research and teaching hospital. But what pet owners may not know, is that similar options are available in veterinary medicine. Each year at Cummings Veterinary Medical Center, nearly 500 animals participate in clinical trials, with upwards of 30 studies enrolling patients at any given time. Yet because clinical trials often test therapies before it is known how well they may work, there are often misconceptions and confusion about the process of enrolling an animal in a study. Here, Cheryl London, V90, a veterinary medical oncologist and director of the new Clinical Trials Office at Cummings School, addresses some common myths about trials and explains how they really work. As in human health, participation in veterinary clinical trials is always voluntary. If a trial might help, experts explain the potential risks and benefits, any diagnostics or procedures involved, and all the financial considerations. Pet owners then review and sign a consent form detailing the study’s goals. While the study is ongoing, three veterinary technicians (nurses) with more than 50 years of cumulative experience, along with veterinary doctors, monitor each participating pet’s health closely. “The safety of our patients is the most important thing to us, and owners are encouraged to ask us lots of questions along the way,” said London. Many veterinary clinical trials are “open label”—meaning pet owners know the exact drug on trial—and also not placebo-controlled. That means, for example, that the pet doesn’t get a sugar pill in place of the promising drug. Sometimes pets undergo the current standard therapy for their illness, in addition to the experimental therapy that researchers hope will improve outcomes. Often, there’s also a reimbursement in the form of an “in-store credit” for participating in a study. For example, a dog with a soft-tissue sarcoma might receive immunotherapy in a study and then, after blood tests and a biopsy, the owner could receive $2,000 toward the removal of the dog’s tumor. The goal is to defray a significant part of the typical cost for the standard treatment. Clinical trials are available for a wide variety of diseases in smaller animals, such as dogs and cats, as well as horses and farm animals. Trials now ongoing at Cummings School include those advancing our understanding of cardiac conditions, kidney and liver diseases, arthritis, skin and orthopedic problems, and neurological conditions. You can find open studies at Cummings School through its clinical trial website and search for other available studies through the American Veterinary Medical Association’s Animal Health Studies Database. While geographic proximity is important, pet owners might have more options than they realize—some studies have as many as 10 participating sites nationwide. 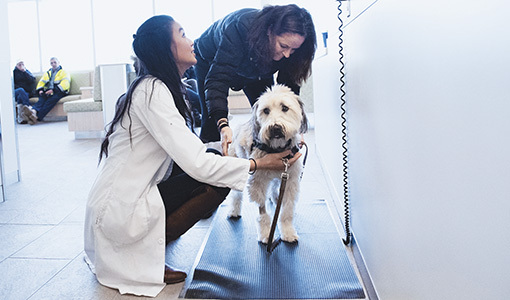 And to mitigate the strain of travel on owners, researchers can sometimes partner with a specialty practice closer to the homes of animal owners. Two new clinical trials at Cummings School seek to advance the development of promising new therapies that use the body’s immune system to fight cancer. The work is funded by more than $5 million in grants from the National Cancer Institute of the National Institutes of Health through the Cancer Moonshot initiative—and part of a larger effort to study how immune therapies work in dogs with naturally occurring cancer to improve similar approaches in people. The first grant is a collaborative effort between Tufts and Cornell University to evaluate new combinations of immune therapies for treating canine B cell lymphoma, one of the most common tumors in dogs. As canine and human B cell lymphoma are closely related, the goal is to develop a chemotherapy-free treatment regimen that results in long-term survival in dogs, and then use these findings to design future human clinical trials. The second grant is a collaborative effort between Tufts and Colorado State University focused on osteosarcoma, a bone cancer in both dogs and children, for which no therapeutic improvements have occurred in over 30 years. The purpose of this work is to screen the effectiveness of four new immunotherapy drug combinations in treating and ultimately preventing spread of osteosarcoma to the lungs. For more information on clinical trials, email clinicaltrials@tufts.edu.